Marfan syndrome is a life-threatening genetic disorder of the body’s connective tissue. Knowing the signs of Marfan syndrome, getting a proper diagnosis, and receiving the necessary treatment can enable people with Marfan syndrome to live a long and full life. What are the features of Marfan syndrome? What is life like for someone with Marfan syndrome? 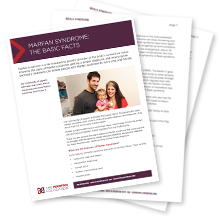 Find these answers and more in "Marfan Syndrome: The Basic Facts"